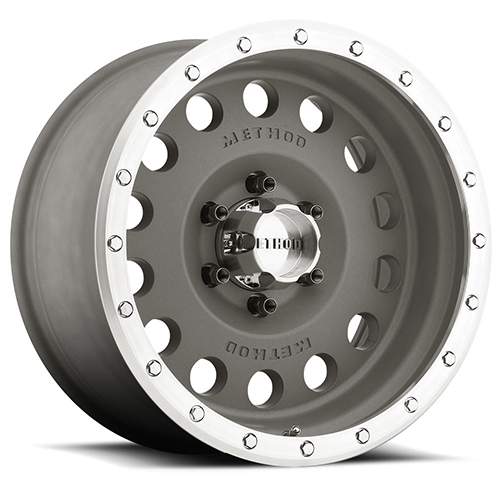 You can get these Method Race Hole Magnesium Grey Machined Street Lock 16x8 6x139.7 0et 108 Hub wheels from All Star Motorsports. With the lowest prices on the internet, these quality wheels are built with your styling in mind. Each wheel with its own attributes, is in a class of its own. Refined quality, precision build only begins to introduce the Method Race Hole Magnesium Grey Machined Street Lock 16x8 6x139.7 0et 108 Hub line-up. With a wide range of sizes, All Star Motorsports has the wheels you are looking for. Match them up with any of our wide variety of tires for a complete wheel tire package. Included in our packages are free mount balance, free lugs, free locks and free hub rings. Need tire pressure sensors? We offer those for an additional fee. All we need is your vehicle information and in rare occasions, your vehicle identification number (VIN code). We are the professionals; let us worry about the fitment. All you need to worry about is finding the wheel of your dreams. With the year, make and model, we have all the necessary information we need to secure the proper fitment for your car or truck. Please note: if you already have a modified suspension please inform your All Star representative to help guarantee fit. Order your All Star package today!